(ii) The third-party fees of the working parties involved in the transaction. Of the two, the securities cost is almost always the more significant of the two costs. It is based on the difference or "spread" between the borrower's loan rate and the current yields on the permitted securities. The lower the spread is, the lower the securities cost. It is possible, in fact, for a borrower to get a "discounted" defeasance, wherein they pay less than their remaining loan balance. If there is a negative spread (i.e., the borrower's loan rate is lower than the securities' yields) the cost of the securities will be less than the borrower's remaining loan balance. This "discount" is only possible in a defeasance and is not possible in any other types of loan prepayments (such as a Yield Maintenance) which have a minimum prepayment penalty (typically 1% of the remaining balance). 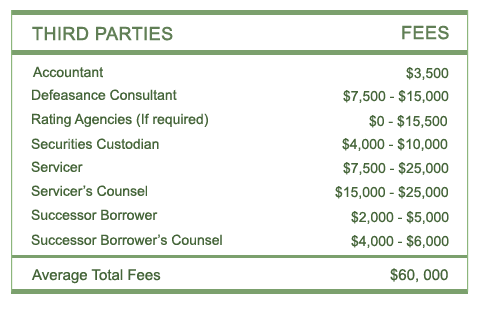 The third-party transaction fees depend on the parties involved and the provisions of the Borrower's loan documents. An outline of the fees is listed below. For borrowers with yield maintenance clauses, Equity Defeasance will provide a free calculation of their yield maintenance premium. The yield maintenance language can often be confusing and ambiguous and there is not a uniform formula for calculating the premium. It is important to have a third-party verify the calculations of the Servicer to ensure the formula in the loan documents is followed correctly and there are no misunderstandings. Equity Defeasance offers our clients a complimentary review of their new loan documents. Loan documents are long and technical and it is easy to overlook some of the important prepayment and defeasance related clauses. We identify these clauses and advise our clients on necessary terms to include in the documents that can help save a significant amount of money on any future defeasances, prepayments, or assumptions.